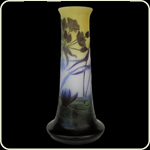 This glass vase called “Rise and Fall” is made in the year 2006 by the Australian glass artist mr. Rod Coleman. 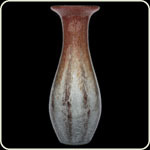 I placed this vase on my website just to let you enjoy the beauty of this vase. 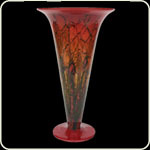 This vase is made of several red colored glass layers, acid etched and then again blow out from the inside with a yellow glass layer that comes through the holes to the outside. Tall: 12.0″. 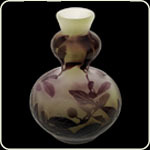 Wonderful WMF Ikora chalice Vase. 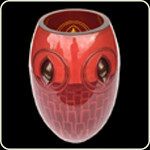 Posted in Sold, WMF Ikora | Comments Off on Wonderful WMF Ikora chalice Vase. 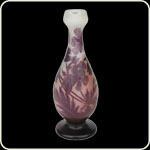 A very rare and uncommon design from this Legras glass vase. 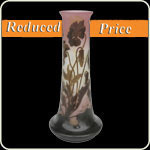 Superbe quality Legras glass vase with an Art Deco design. 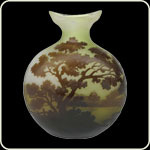 Perfect colored and etched. 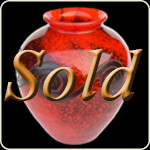 An superbe collectors item. Tall: 8.0″. 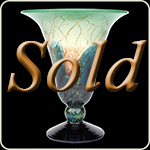 Signed Legras. Mint condition.